Semple kicking for goal in East Coast colours. 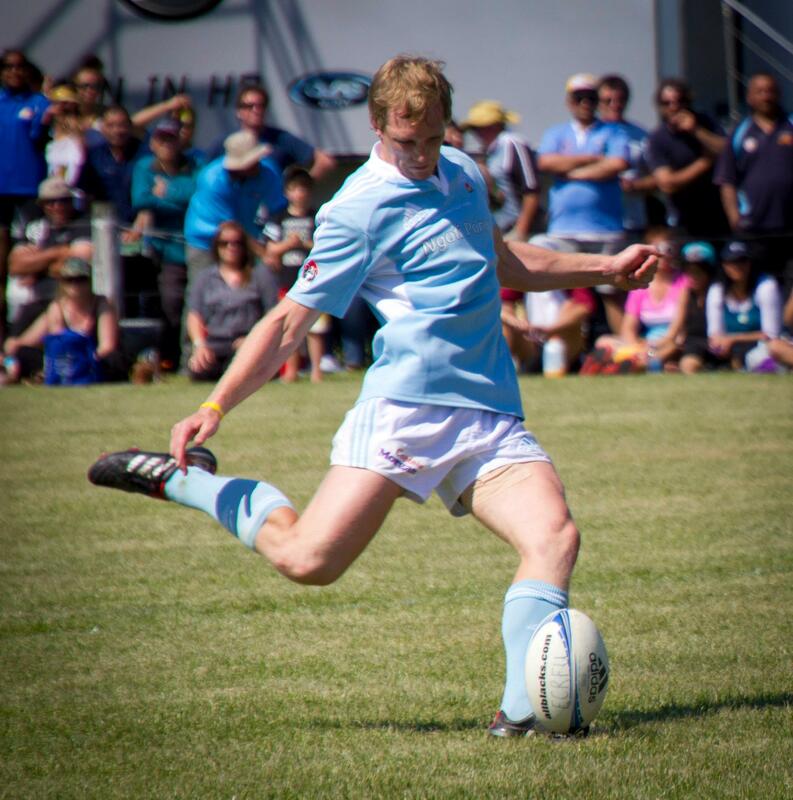 Currently training with Hawke’s Bay as part of their wider squad ahead of the ITM Championship, which kicks off in August, Ulsterman John Semple has enjoyed much success since arriving in New Zealand last year. He has risen through the ranks of the club game and says “I’m going to keep pushing and playing as hard as I can.” So far, he describes his experience as “awesome” and feels that other Irish players could benefit from a similar move. Semple’s rugby career started at Limavady CRFC, near his hometown of Drumsurn in County Derry. Even at that level, his potential was apparent and he was part of the Ulster Junior team for two seasons in a row. 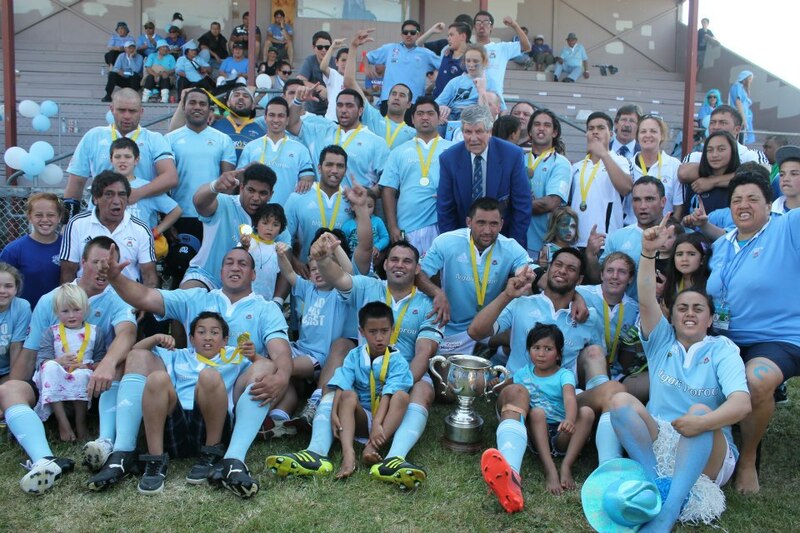 Semple and his East Coast teammates, including Rua Tipoki, after their Meads Cup success. Kiwi friends made during his Limavady days helped Semple to organise a team in Christchurch, which has “some of the strongest club rugby in all of New Zealand.” Semple had a strong season with New Brighton in the Senior Division 1, but a step up to play representative rugby for Canterbury would have been huge. Semple lining out for Taradale in the Nash Cup. 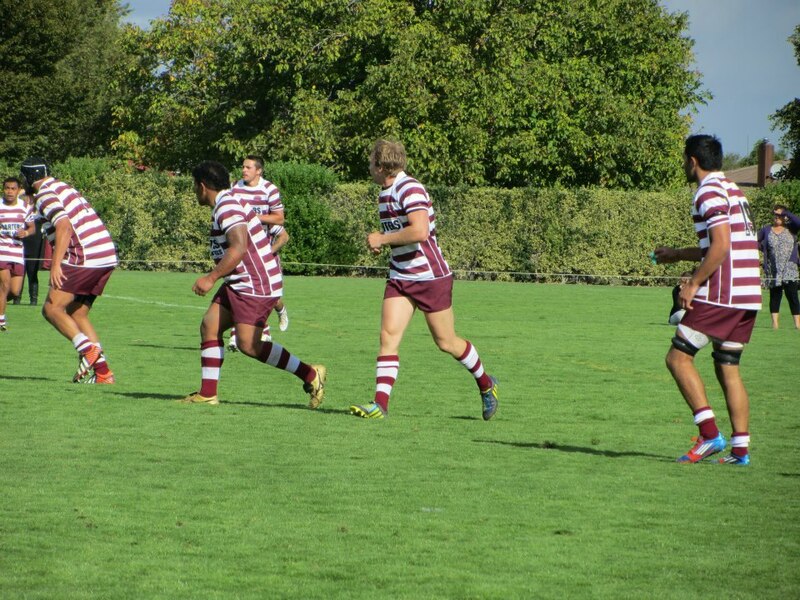 “Back home there’s contracted players who stay out of club rugby as much as possible. Maybe it’s different for academy players. The older players contracted to Ulster, they don’t even watch that much club rugby. “I’d say take a year out and have a go. Nothing at home is going to change. Just have a go is what I’d say. It’s easy really, all you have to do is get in contact with a club and they’ll try and help you out any way they can. Brian O’Driscoll celebrates after Leinster’s magnificent Heineken Cup win on Saturday. (c) Ken Bohane. There’s plenty of coverage in today’s media of Leinster’s incredible win over Ulster in the Heineken Cup final on Saturday. There’s really no need for me to cover the game in a general sense, because it’s all been said by now. Instead, I’m going to focus on one of the key individual battles which Leinster won. They came out on top of most of these positional match-ups across the field, although Paddy Wallace, Dan Tuohy, John Afoa and Craig Gilroy all impressed. Having played in the centre myself, the midfield area usually draws much of my attention. Saturday’s game saw a really interesting battle of the master versus the apprentice at outside centre. Brian O’Driscoll is a legend of the game, a once in a lifetime player. Opposite him was Darren Cave, of whom I’m a big fan and had previously suggested worthy of a place on Ireland’s summer tour to New Zealand. Cave’s performance on Saturday was excellent, but O’Driscoll proved far more decisive. Ulster had a strong start to the game, flying out of the blocks and looking more up for it than Leinster in the first five minutes. Cave made a scything break after just 3 minutes (11.50 mark on the video below) as he dummied to an inside runner, completely bamboozling Leo Cullen. Cave almost got around Rob Kearney for the opening score of the game, but the fullback just held on to him. Cullen recovered well to illegally steal the ball and Leinster got away with their early lack of concentration. It was a clear indicator that Ulster’s outside centre was up for this game. In the piece linked above, I wrote that Cave needed some standout displays on the big stage to win over the doubters and the 25-year-old was definitely intent on leaving his mark. He continued to pose a threat to Leinster’s defence for the remainder of the game, with his 11 runs leaving him behind only Ferris and Afoa in Ulster’s carrying stakes. Cave topped the charts for his side in terms of metres gained while in possession, with 41. Defensively, the main highlight for Cave was his try-saving tackle on Eoin Reddan in the 22nd minute ( starting at 33.20 on the video below) when he came from a long, long way back to grab the scrumhalf after Gilroy had missed his own tackle. Cave has been defensively excellent all season long, with missed tackles a rarity. He reads the game well and more often than not, puts himself in a good position to make his hits. But shackling O’Driscoll was a far greater task than what he had faced previously. O’Driscoll again proved himself a medical freak to be playing at all. Once again, massive kudos to Leinster’s backroom staff for enabling him to take to the field. The effort was hugely worthwhile, as BOD was a class above almost everyone else on the pitch. There were only two occasions when he got one on one with Cave, but both times he got around his opposite number. O’Driscoll doesn’t possess the same top-end pace as he once did, but his footwork was enough to show Cave that he has a distance to go if he is to challenge for Ireland’s number 13 jersey. O’Driscoll’s performance bodes will for Ireland’s prospects in New Zealand. (c) Ken Bohane. Both times, O’Driscoll shifted his feet, forced Cave to sit back on his heels, then got outside him with a little burst of acceleration. As I said above, Cave’s defensive positioning is a strength and against any other opponent he would have completed the tackles. But O’Driscoll just slipped past him twice. It’s exactly the level that Cave would want to be tested at, and the experience will have been of great benefit to him. (The best example is at 37.36 in the vid below). O’Driscoll added some world-class touches throughout the game to really stamp his mark. That offload in the build-up to Cian Healy’s try showed exactly how much intelligence and vision Drico possesses. Watch it again from 43.20 in the video and you can see that the Leinster centre knows exactly what he’s going to do even before the ball is in his hands. Genuinely talented players go through the game with their heads up, scanning the defence and immediately recognising what’s on. It’s yet another example of O’Driscoll’s genius. Cave appeared to be inspired by the master’s demonstration of skill and even threw in his own little flick pass in the second half, when he ran a switch with Trimble. The flick wasn’t really necessary, but it was encouraging to see that Cave had the confidence to bring it off. And this inspiration is exactly what Cave should be looking to get from the tour to New Zealand now that he has been selected. He has certainly earned his place on the plane, after what has really been his breakthrough season for Ulster. This is an incredible opportunity for the twice-capped midfielder to take his game to the next level. Training against and learning from O’Driscoll every day will almost certainly show him exactly what he needs to do to push through at international level. Just as playing opposite O’Driscoll on Saturday brought Cave to new heights, touring alongside him is the next step in his learning curve. Stefan Terblanche attacks during Ulster's 22-16 win over Munster in the quarter-finals. (c) Sean Mulligan. This is completely new territory for Ulster. Their first Heineken Cup semi-final since 1999, when they famously went on to win the tournament. More importantly, Ulster are the clear favourites for tomorrow. It’s a position that they haven’t had to deal with in any of their big games this season so far. How Ulster cope with that tag could have a telling effect on the outcome of the clash with Edinburgh. Let’s take a closer look at Ulster’s three most important wins this season. All the way back in November, Brian McLaughlin’s side opened their H-Cup campaign with a hard-fought 16-11 win over Clermont in Ravenhill. A loss there would obviously have had disastrous effects. Coming into that game, all the pre-match talk had been about Clermont’s power and pace – Rougerie, Byrne, Bonnaire and Parra. It’s worth remembering that Ulster were viewed slightly differently as a team back then. While, the pressure was most certainly not off Ulster, no one would have been greatly surprised to see Ulster lose. Despite Clermont winning the set-piece battle and edging the possession/territory stakes, Ulster pulled off a confidence-boosting victory. Their now trademark aggressive defence was led manfully by Stephen Ferris and Ian Humphreys’ try came from an incisive counter-attack following a Clermont knock-on in the Ulster half. Ulster's defence has been a strength. In this photo, Stephen Ferris is typically bursting up ahead of the defensive line. (c) Alan06. The next key result was the 41-7 mauling of Leicester, again at Ravenhill. This was another match where Ulster weren’t viewed as definite favourites. The Tigers were still pushing hard for a quarter-final spot at that stage. Once again, Ulster were second-best at the set piece, and were narrowly shaded in terms of territory and possession, yet they still managed to tear the Tigers apart. As with the Clermont game, Ulster’s defence shut down a Leicester side who are easily the top try-scorers in the Premiership. We’ll come back to Ulster’s attacking performance that day. So, to the quarter-final win in Thomond Park. It’s fair to say that Munster were the narrow favourites for the majority of fans and bookies. The home side had a whooping 72% possession and 79% territory, but Ulster again came out on top. While Munster’s attacking play was very limited, it’s hard to emphasize Ulster’s phenomenal defensive effort enough. Their try, from inside their own half, was a mixture of Craig Gilroy’s ability with ball in hand and Munster’s unacceptably poor tackling. The major point is that Ulster’s three biggest wins of the season came in matches where they were slight underdogs and didn’t expect to dominate possession (nor did they). Against Edinburgh tomorrow, both of these aspects will be reversed. Encouragingly, Ulster have strong leaders in the likes of Johann Muller, Ruan Pienaar, Rory Best and John Afoa. Still, it will be intriguing to see how McLaughlin and his charges handle the expectation. This won’t be a game where the opposition will have long spells of possession and Ulster can simply batter them with their aggressive defence. Muller and his pack will expect to provide quality possession to Pienaar at 9. (c) Ivan O'Riordan. We go back to that glorious win over Leicester for the attacking template that Ulster should look to use. The first try that day was sheer excellence. It was kick-started inside Ulster’s half as two passes put Wannenburg in space out wide on the right. The South African’s offload was followed by Trimble’s before the move was slightly halted. Following a few patient phases, Ferris’ burst put Ulster back on the front foot and Trimble finished in the corner. That’s Ulster at their best. One or two direct boshes in tight (Trimble, Tuohy, Muller etc. run at Laidlaw!) followed swiftly by long passes into a wide channel. As pointed on Whiff of Cordite, Ulster’s 9-10-12 axis are all lovely passers of the ball, and that doesn’t change with the selection of Paddy Jackson at 10. As the lads highlight, that Gilroy try vs. Munster is another fine example. Trimble up the middle, then two long passes (Humphreys, that’s an absolute beauty!) to the wide channel. While the 21-year-old isn’t going to finish like that every time, it still allows Ulster to play to their strengths. Ulster’s pack looks slightly stronger than Edinburgh’s, although with John Afoa missing, Edinburgh will expect to get on top in the scrum. Even without Chris Henry, Ulster’s forwards should be able to provide Pienaar and Jackson with a steady share of quality possession. If Ulster can manage the added pressure of favouritism, retain their disruptive defensive style and unleash their most effective attacking patterns then they’re a banker to get to the Heineken Cup final. Once there, they will return to the role of underdogs against Clermont or Leinster. As we’ve seen before, that’s a position which suits them. Photos courtesy: Ivan O’Riordan, Sean Mulligan, Alan06. 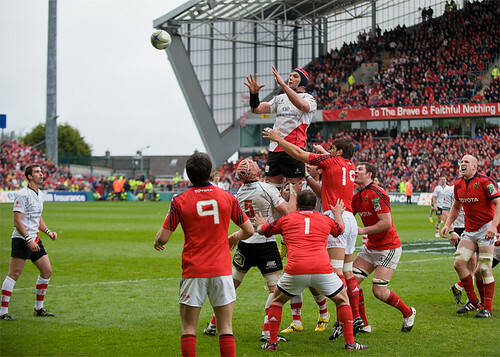 Cave (2nd from top) in action during Ulster's quarter-final win over Munster. (c) Sean Mulligan. In the first ever post here on The Touchline all the way back in November of last year, I suggested Darren Cave as a potential replacement for the then-injured Brian O’Driscoll. Cave’s pre-Six Nations form this season demonstrated that the 25-year-old has the ability to eventually do so. Unfortunately, a foot injury sustained in January prevented any possible international inclusion. Saturday’s Heineken Cup semi-final against Edinburgh presents a prime chance for Cave to put himself back in contention. The Holywood man is back in action now and has played the full 80 minutes of Ulster’s last three games, including the quarter-final win over Munster. Like the rest of Ulster’s backline, he had a quiet game in terms of attack as Munster dominated possession that day. In defence he was as solid as ever, making all 12 of his tackles. It’s very rare to see Cave miss a hit. His defensive positioning at outside centre, an extremely difficult channel to defend in, is always good. Some Irish fans will have reservations about Cave due to the fact that he is often unglamorous in attack. While Keith Earls, and Brian O’Driscoll is his pomp, can create line breaks from seemingly nothing, Cave is a more direct runner. For Ulster, Paddy Wallace at 12 gets the best from Cave with his creative skills. Wallace’s subtle ability to feed ball-carriers running smart lines is greatly underrated. If Cave is to excel against Edinburgh, Wallace’s fitness will be crucial and thankfully it now looks likely that he will play. Cave (background) is at his best when Wallace (headband) plays inside him. (c) Liam Coughlan. At 6’0″ and close to 100kg, Cave is ideally built for his position. He may lack the top-end pace of a world-class 13 but he is very powerful in the contact area. Look back to Ulster’s mauling of Leicester in January, perhaps their most complete performance of the season so far. Cave only carried 5 times that day, but made 25 metres gain in total, beating 2 defenders and creating a clean line-break. That’s a typical Cave stat sheet. He’ll rarely beat a defence with a lightning fast side-step, but he will repeatedly punch holes. His support play is also a real strength (as illustrated below). I’m not suggesting that Cave is anywhere near his level, but a decent comparison would be with New Zealand’s Conrad Smith. The Hurricanes captain is not particularly flash, but his defensive game is world-class. In attack, he rarely beats someone with jaw-dropping footwork and pace, but his contributions are vital. Quietly and superbly efficient. Edinburgh’s likely centre partnership on Saturday is Scotland internationals Matt Scott and Nick de Luca. Cave and Wallace should be confident of giving Ulster a clear advantage in midfield. 28-year-old De Luca has 33 caps for his country but has largely failed to excel. He seems to carry a reputation as a creative influence, but the outside centre has never shown consistent evidence of it at the top level. At PRO12 level, he’s a decent provider for Tim Visser. Inside him, Scott is still only 21. He made his Scotland debut off the bench against Ireland in this year’s Six Nations, looking fairly nervous as he over-ran a couple of promising offloads. On the four occasions De Luca and Scott have played together in the Heineken Cup this season, they have only manufactured a single line-break between them. Their threat is minimal compared to what, for example, Leinster face in the other Heineken Cup semi-final. Cave should be confident of shutting them down. One argument that might be created against Cave’s inclusion at international level is that he has never bossed a top-level game. His confidence has grown this year; his performance in that mauling of the Tigers being one example. 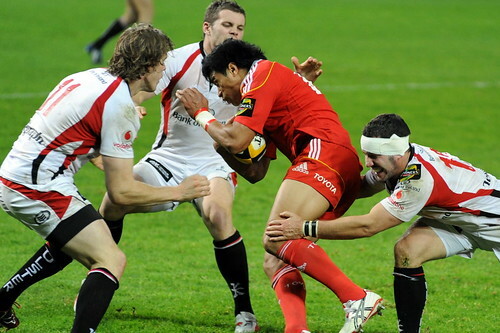 Now that Ulster have returned to the business end of the Heineken Cup, it’s time for Cave to dominate a game. Saturday is a perfect opportunity for him to do so. Photos courtesy: Liam Coughlan, Sean Mulligan. John Andress, pictured playing for Harlequins, is now at the Exeter Chiefs. (c) Mike Davies. It’s clear that Ulster are a club side making long strides of progress year on year. Next weekend could see the province secure a place in the Heineken Cup final for the first time since winning the trophy in 1999. While we have to praise the northern province for bringing through home-grown players like Craig Gilroy, Darren Cave and Paul Marshall, amongst others, it’s also obvious that Ulster’s foreign imports have played a huge role in the success. If Ulster continue to grow they could join Leinster at the forefront of the club game. That would in turn increase the difficulty for young players to break through at the province. Coupled with their overseas signings, it may mean more Ulster-based players looking for moves abroad. In this week’s Exiled Irish installment, I look at four Ulster-bred players who have moved to the Aviva Premiership. As always, opinions on all of these players, and any I have missed, are hugely welcome. If you watch plenty of Premiership rugby, how do you rate these players? Caldwell joined Bath at the start of this season after opportunities at Ulster had dried up. The 27-year-old originally broke into the set-up at his home province in 2005, eventually becoming first-choice for the ’07/08 and ’08/09 seasons. 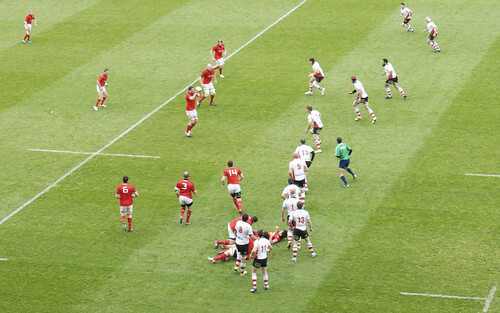 Two Ireland caps followed in May 2009, against Canada and the USA. However, the signings of Dan Tuohy and then Johann Muller pushed Caldwell down the pecking order and he made just 6 appearances in the ’10/11 season. Caldwell decided to move on to new pastures, taking up Baths’s offer and he has thrived since. The 6’7″ lock has become an integral part of the set-up at The Rec thanks to his physicality and lineout skills. He has been ever-present in the first team, playing all six of the Heineken Cup fixtures and scoring two tries. While Bath haven’t had a vintage season, sitting 7th in the Premiership with one game left and winning only two of their Heineken Cup games, Caldwell has clearly benefited from his move. Another strong effort next season might see the second-row back in contention for international honours. Steenson in action against Harlequins last season. (c) David Coldrey. Coming through at underage level, it seemed nailed-on that Steenson was going to represent Ireland at the highest level. The outhalf was top points scorer at both the 2004 and 2005 U21 World Cups. In ’04, he guided Ireland to the final, where a New Zealand side including Luke McAllister and Jerome Kaino denied them a famous win. He subsequently graduated from the Ulster Academy as a genuine prospect. However, David Humphreys was still bossing it on the pitch for Ulster so Steenson took the ambitious leap of joining Championship side Rotherham Titans for the’06/07 season. That move proved a success as Steenson amassed 264 points before joining the Cornish Pirates. That stint lasted also lasted single season before the ambitious Exeter Chiefs secured the young outhalf’s signature for the ’08/09 season. Steenson was key to the Chiefs to promotion in ’09/10, scoring 24 points in the play-off final. The Ulster man’s first season at Premiership level was a further success as the Chiefs finished 8th and Steenson was again top points scorer. This year,the 27-year-old has lost his place due to the brilliant form of Argentinian flyhalf Ignacio Mieres, limiting Steenson to just 7 starts. The Dungannon native is contracted to the Heineken Cup-bound club for next season and will hope to reclaim his place in the team. Best (right) during his time at Northampton. Alongside him here is fellow Ulster man Roger Wilson. (C) Henry Southgate. It might surprise some Irish supporters that Best is still playing, but he’s actually only 33. He made his debut at Ulster in 2002 and would go on to make 122 appearances for the province, winning a Celtic Cup and a Celtic League. The flanker made his Ireland debut against the All Blacks in 2005 and was capped 18 times, including 4 substitute appearances off the bench at the 2007 Rugby World Cup. Northampton enticed the aggressive back-row to the Premiership for the ’08/09 season and Best quickly established himself as first-choice, winning the European Challenge Cup in 2009. An 18-week ban for eye-goughing was an obvious lowlight. In 2009, he captained Ireland ‘A’ to Churchill Cup glory in the United States. For the ’10/11 season, 6’3″ Best dropped down to the Championship to join current club Worcester Warriors. He helped his new team to promotion at the first time of asking. 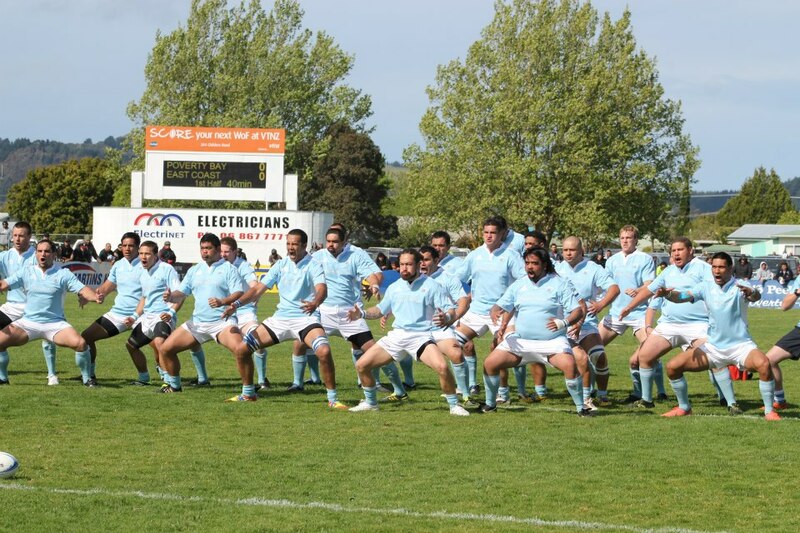 The Warriors have retained Premiership status for next season, with a likely final position of 10th. A broken arm has meant only 10 starts for Best this season, but he still has plenty to offer in terms of leadership and physicality. A brick wall of a man. A current teammate of Steenson’s at the Exeter Chiefs, Andress also played alongside the outhalf at the 2005 U21 World Cup. 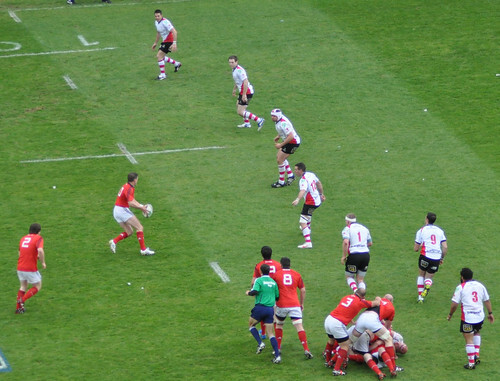 The tighthead prop was on Ulster’s books for the ’05/06 season, but a reputation as someone with a poor attitude meant no appearances for the province. He moved to then-Championship side the Chiefs in 2007 and two impressive season at that level resulted in a switch to Premiership outfit Harlequins at the beginning of the ’09/10 campaign. Andress made 19 starts in his first year in London, but that dropped to 11 the following season. The Belfast native made a return to the Chiefs for this season, but again opportunities have been limited (8 starts), mainly due to the strong form of Hoane Tui. That has led to Andress’ decision to join Neil Best at the Worcester Warriors next season, where he will expect first-team rugby. Andress is capped for Ireland ‘A’, winning the Churchill Cup with Best in 2009. A senior call-up has never followed. However, some strong displays from the 28-year-old next season would mean Ireland could create better depth at tighthead. Andress will be closely watched. Photos courtesy: Henry Southgate, Mike Davies, David Coldrey. Sexton contributed 11 points to Leinster's win over Ulster. (c) Ken Bohane. Ulster’s play-off hopes look to be almost certainly over after losing to a powerful Leinster side in Ravenhill on Friday night. While the northern province could still mathematically claim 4th spot with an unlikely bonus point victory over Munster in two weeks’ time, a win the same weekend for either the Warriors or the Scarlets would deny Ulster. Even more worrying was the sight of Pedrie Wannenburg, Chris Henry and Paddy Wallace all leaving the pitch injured during Friday night’s loss. Henry and Wannenburg’s withdrawals looked to be precautionary, but Wallace looked dazed, if not concussed, leaving the field. Fingers will be crossed across the country that those three recover for next Saturday’s Heineken Cup semi-final against Edinburgh. Meanwhile, Leinster were impressive without ever cutting loose. Kevin McLaughlin crashed over after some poor Ulster defence and Jonny Sexton added 11 points, including a smart drop goal. This win confirms top spot for Leinster with a game away to the Dragons remaining. Unfortunately, this game was not televised but it sounded like there was great excitement at the Sportsground. This win makes it 3-in-a-row in the PRO12 for Connacht, their best league run since 2004. Aironi, in their last ever away fixture, raced into a 16-3 half-time lead but Connacht gradually hauled themselves back with Rodney Ah You’s 74th-minute try, converted by Miah Nikora, leveling the game. The stage was set for replacement fullback Matt Jarvis to make himself the hero with a long-distance penalty, the final act of the game. In case you missed it, I wrote a piece on Friday about the progress being made at Connacht. Check it out here. Next weekend, they travel to the Warriors, for whom a win would secure play-off status. A victory for Connacht would see them equal their record for most league wins in a season, set at 8 in 2004. If they were to deny the Warriors a losing bonus point, it would give Ulster a slim, slim chance of sneaking into the play-offs. At the end, Munster were clinging on as the Scarlets launched a desperate effort to find a winning score. A draw was a fair result after a game in which neither side managed to take control. The hosts opened the scoring through Sean Lamont’s superb team try but Munster responded swiftly, with Donnacha Ryan strolling through Rhys Preistland’s uninterested tackle to touch down. Simon Zebo was next over after taking Keatley’s intelligent inside pass and using his pace to finish. Aaron Shingler’s second half score put the Scarlets right back in it, and Priestland’s 70th-minute penalty drew them level. The Scarlets looked the more likely winners in a wildly open last 5 minutes but the visitors held on. The draw means that Munster can’t overtake the 2nd-placed Ospreys for a home play-off. They are now guaranteed an away semi-final though, most likely against the Ospreys. Munster finish the regular season with the chance for revenge over Ulster in two weekend’s time. Ian Madigan was superb for Leinster yet again. (c) Ken Bohane. Another of those fantastically watchable Leinster nights at the RDS. They had eight different try-scorers as Ian Madigan picked up the Man of the Match award for some superb play-making at outhalf. Declan Kidney has to be taking note. Leinster are now guaranteed a home play-off spot and it’s looking increasingly foolish to bet against them doing a Heineken Cup and PRO12 double. Their strength in depth is frightening, with competition in every position. Edinburgh were close to full strength but looked tired after their Heineken Cup efforts the weekend before. Some of the tries they conceded were soft but Leinster were emphatically deserving of such a scoreline. On Friday, Leinster travel to Ravenhill to take on Ulster. If both sides decide to rest their first-choice players before H-Cup semi-final weekend, Leinster look to be much, much stronger. Connacht won an entertaining inter-pro derby thanks to two Miah Nikora penalties in the closing quarter as Ulster’s indiscipline cost them. Following the heroic efforts in beating Munster the weekend before, Brian McLaughlin called on his second-string, many of whom weren’t up to the task. That’s not to take away from a deserving Connacht effort, which featured tries from Nikora, Gavin Duffy and Tiernan O’Halloran (another impressive finish) as well as a commanding Man of the Match performance from George Naoupu. Ulster remain one place outside the play-off positions after this crucial loss. The Warriors earned a losing bonus point to pull two points clear in 4th, while the Scarlets win in Aironi leaves them a single point behind Ulster. With Leinster’s visit next, then a Heineken Cup semi-final, it’s a testing few weeks for the northern province. Encouragingly, Paddy Jackson gave a promising display at inside centre. Meanwhile, Connacht remain in 10th despite their win. They host Aironi next weekend; a great chance for back-to-back wins. 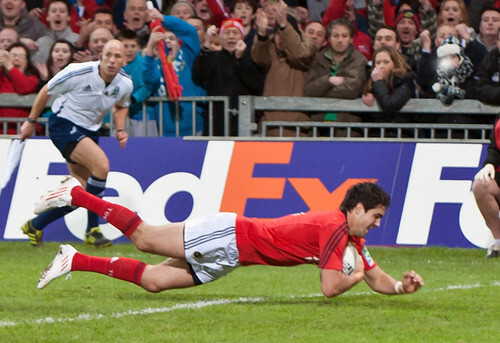 Conor Murray scored a try in Munster's 35-29 win. (c) Ivan O'Riordan. Munster had to work hard for an important win over fellow play-off hopefuls the Warriors on Saturday evening. Tries from Luke O’Dea, Peter O’Mahony and replacement Conor Murray plus 20 points from the boot of Ian Keatley were enough. Scottish star Stuart Hogg scored a hattrick for the visitors in a display which showed his exciting potential. For Munster, O’Dea’s pace was as impressive as ever while O’Mahony was excellent in all facets of the game to earn Man of the Match. The Ospreys’ win over the now pitiful Cardiff Blues means that Munster remain 3rd in the table. Next up is a tricky trip to the Scarlets on Saturday, who are also still in contention for the play-offs and also looking for revenge after Munster’s double over them in the Heineken Cup. Tony McGahan will hope to welcome back several players from the long injury list, particularly Paul O’Connell. Next weekend promises to be another exciting round of PRO12 fixtures. Photos courtesy: Ken Bohane, Ivan O’Riordan.